If I wasn't human I would love to be a cat. What a hard life they have. Sleeping, eating, sleeping, washing, sleeping, eating. You get the gist. So what better product for your pampered pet than the CatIt Senses Massage Centre? 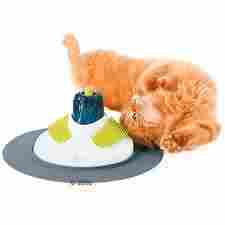 Or if your cat is not keen on this type of product perhaps you can learn kitty massage. So Is Massaging Your Cat Beneficial? There are people who will think that massaging a cat is stupid. They get stroked, that's enough isn't it? Well, just like humans all animals benefit from massaging for psychological reasons as well as physical. Massage stimulates the nerves in the body, the muscles, circulatory system and lymphatic system. It enhances range of motion, increases the supply of oxygen and nutrients to muscle cells, relieves muscle spasms and helps to flush away toxic compounds, such as lactic acid, that cause pain. The other point is this is a lovely way to bond and gain the trust of any new pet you bring home and you will also feel a great sense of relaxation too. Obviously not all cats will want you trying out your amateur massage skills on them, but if you take just a few minutes a day when your cat is relaxed but not sleeping, you will soon find out if this is for them or not. You probably already have a rough idea of certain techniques. Don't forget, it's the masseurs intent that makes massage different from just simple stroking of your cat, and any animal can sense if you're really interested. A good way to begin is to talk to them in a soothing tone, stroking them in their favourite places so that they feel relaxed and comfortable with you. Then start from the top of their body working your way down and apply a small amount of pressure using the palms of your hands or your fingertips on the areas that you usually stroke your cat. For example - the back of the neck, the shoulders, the base of the tail and down their spine. In time, if your cat grows to like being massaged you can move to the sides of the stomachs and their legs. This will take time and trust and I would suggest only doing a few minutes a day. Just like humans have different preferences so do your pets. They may like firmer pressure in one area and lighter in another part. Cats either love having their tummy's stoked or they hate it. If they allow you to massage their stomachs do it very gently and be prepared for them to suddenly change their mind and swipe your hand away. Even with you they may feel too vulnerable to let the massage progress to the belly area. Another place to avoid is the hind legs. Cats hate to be touched there, but if in time they become relaxed enough to allow this, do it very lightly and for a small amount of time. Watch for their reactions and remember their favourite spots. You may find that it's easier to use a massage centre first. It will show you which areas your cat prefers and what kind of pressure they enjoy. Of course they may ignore it completely and play with the box that it comes in instead. The Catit massage centre comes with catnip to entice them to use the centre. I found that my cats needed more to start off with. We all know how untrusting cats can be until they're good and ready, so extra catnip is a good idea. The Catit Massage Centre should appeal to your cat's sense of touch. It comes with a variety of massage pads, so why not pamper your cat with a purely luxurious experience. For any animal with joint pain and arthritis you should always consult your vet first and of course don't massage your cat if she is pregnant or sick. Pet Promenade. Simple theme. Powered by Blogger.